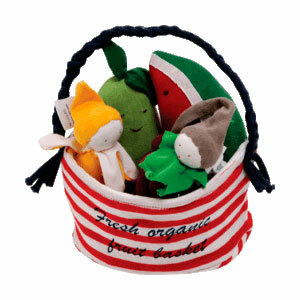 Your child is going to love this delightful set of organic fruit friends. A perfect way to introduce healthy eating habits, each cuddly little fruit displays its own charming facial expression and makes terrific teething toys and playtime companions. And you thought fruit was just a healthy snack! A pear, banana, slice of watermelon and cluster of grapes are included in this set and come with an adorable striped tote for travel ease. This set partners very well with the Organic Veggie Crate.